The Bucovina Shepherd is a livestock guardian that most often works with sheep and cattle. Livestock guardians do not herd their charges, but instead protect them from large predators such as wolves. Hailing from the Carpathian Mountains in eastern Romania, the Bucovina Shepherd is an ancient breed with unknown ancestors. 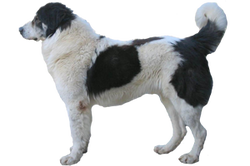 It is believed to be closely related to the Carpathian and Mioritic Shepherds and other livestock guardians from Greece, Hungary, Slovakia, and Poland. Is the Bucovina Shepherd Right for You?